Distillation and Aging: Pineau des Charentes is in the Vin de Liquor category of French aperitifs and after dinner drinks. It is made by combining unfermented grape juice with finished Cognac, for a spirit that is just under 20% alcohol with a touch of fruitiness. 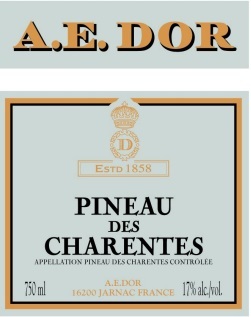 Pineau des Charentes has a minimum aging requirement of one year; A.E. For ages their for 5 years. Tasting Notes: Notes of fresh grape juice and Cognac are combined with a lovely caramel/fig quality from the 5 years of aging. Pineau Blanc can be enjoyed on ice with an orange peel or used in cocktails where a fruity liquor is desired.